The Alaska LRTP was published in September 2012, and the INVEST evaluation began in 2014. The LRTP was developed by several Federal Land Management Agencies (FLMAs) operating in Alaska (National Park Service, U.S. Fish and Wildlife Service, Forest Service, and Bureau of Land Management), as well as the Alaska Department of Transportation and Public Facilities and the WFLHD. The purpose of the evaluation was to identify the INVEST criteria most applicable to FLMAs, and how to best integrate sustainable practices into the development of future LRTPs. A sustainability workshop was held in January 2014 with WFLHD, the FLMAs involved in the development of the multi-agency LRTP, and a consultant team. At the workshop, participants reviewed and discussed the INVEST Version 1.0 System Planning (SP) module and its applicability to the Alaska LRTP, and identified future opportunities for sustainability enhancement. As illustrated in Figure 1, the plan scored 91 out of 250 possible points, for a Bronze rating. Although sustainability was not a specific focus area for the development of the LRTP, the plan performed well in many INVEST criteria, including SP-02 Natural Environment, SP-03 Social, SP-10 Air Quality, SP-11 Energy and Fuels, and SP-17 Linking NEPA and Planning. In several cases, criteria topics aligned with the agencies’ missions, but the agencies lacked the documentation required by these criteria and therefore did not score highly. Criteria in this category included SP-01 Economic Development and Land Use, SP-06 Safety Planning, and SP-07 Multi-modal Transportation and Public Health. Finally, a portion of the criteria were not applicable to the Alaska FLMAs because other jurisdictions (e.g., the State DOT) are responsible, or because the topic is not a priority in a Federal Lands context. These included SP-08 Freight and Goods Movement, SP-13 Analysis Methods, and SP-14 Transportation Systems Management and Operations. The Northwest CLRTP is a collaborative, multi-agency long-range transportation plan for Federal Lands in Washington and Oregon. The plan was developed by five FLMAs, WFLHD, the Washington State Department of Transportation (WSDOT), the Oregon Department of Transportation (ODOT), the Washington State County Road Administrative Board (CRAB), and the Association of Oregon Counties (AOC). A sustainability workshop was held in July 2014 with individuals from many of the agencies participating in the development of the Northwest CLRTP. 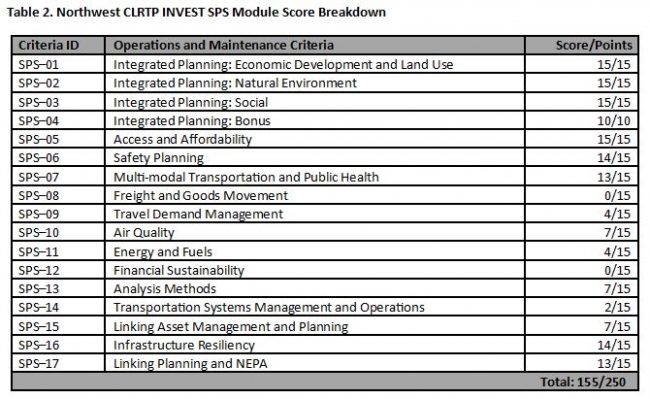 In the workshop, the early draft Northwest CLRTP goals and objectives were compared to the Version 1.0 INVEST SP criteria. The Northwest CLRTP team finished developing the goals and objectives of the plan. In the fall of 2014, the project team conducted an INVEST desktop evaluation of the fully drafted goals and objectives. The purpose of the evaluation was to identify areas of strength and gaps from a sustainability standpoint, and to suggest implementation actions to overcome those gaps. The agencies involved in the development of the Northwest CLRTP were able to use the information from the INVEST desktop evaluation to refine the Northwest CLRTP as it continued to be developed. 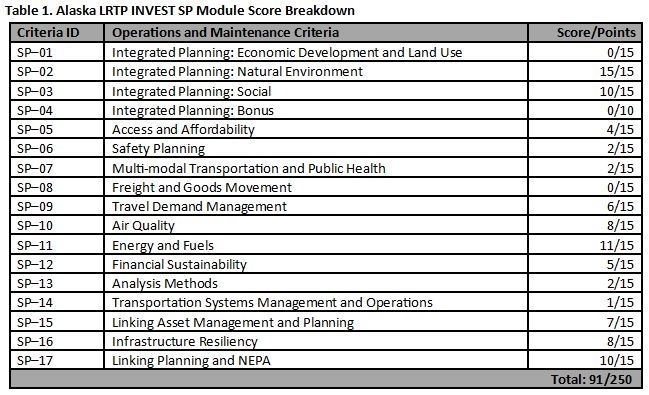 A non-public draft of the plan was provided to the consultant team in the spring of 2016, who evaluated it using the INVEST Version 1.2 System Planning for States (SPS) module. The draft Northwest CLRTP received 155 out of 250 possible points, for a platinum rating (see Table 2 below for a detailed scoring breakdown). The Northwest CLRTP remains under development and is anticipated to be released in 2017. Using INVEST to assess the Northwest CLRTP led WFLHD to identify how to more fully integrate sustainability into long-range planning. Although the INVEST evaluation was conducted as the Northwest CLRTP was being developed, it began after the goals and objectives of the plan had been defined. Therefore, goals and objectives related to sustainability were not integrated into the plan as fully as they could have been. WFLHD recommended that in the future agencies incorporate sustainability into the initial scoping stage of a LRTP, before the goals and objectives are established. In addition, WFLHD recommended including monitoring requirements in an LRTP. Monitoring is required by a number of INVEST criteria, and can demonstrate to the public and partner agencies that sustainable practices are being implemented. WFLHD used INVEST to incorporate sustainability into the development of statewide and multi-state LRTPs for Federal Lands. Conducting the INVEST evaluations at several stages of the planning process underscored the importance of incorporating sustainability early in the development of a transportation plan, before goals and objectives have been determined. WFLHD identified INVEST SP/SPS criteria that may not be relevant for a Federal Lands context, and recommended that in future updates to the SPS module agencies be allowed to exclude criteria that are not relevant to the project type or do not fall under the agency’s jurisdiction.